The Catskill Game Farm Closed in 2006 at the end of its 73rd season. Enjoy this look back. Yes, the Catskill Game Farm evoked sheer delight at every turn as my little one saw the animals she's only known from books--giraffes, lions, sheep, camels, bears--alive and up close for the very first time. The Catskill Game Farm has been delighting children since 1933, and my daughter is actually the third generation of our family who will have cherished childhood memories of this place. My parents both remember visiting the Catskill Game Farm as children, too. Come along with us on a virtual photo tour of the Catskill Game Farm, and you'll get to see for yourself the animals that made my little one squeal. The Catskill Game Farm turned out to be a perfect afternoon destination during a family reunion that we planned in celebration of several milestone family birthdays. My parents, my brother and his girlfriend, my husband and my daughter joined me for a weekend away from it all in the Catskills. We rented a wonderful place, the three-bedroom farmhouse at Cauterskill Creek Farm in Catskill, New York, for the weekend, and this gave us a comfortable and ideal home base from which to explore the region. The Catskills had their heyday in the 1950s and '60s, when expansive resorts and bungalow colonies drew a predominantly Jewish clientele for the summer season. Only a handful of the nearly 500 hotels that thrived during this boom time are still in operation, and the Catskills are now a rather uncrowded choice for a family vacation. I had heard rumors that the Catskill Game Farm had gone downhill, but we were pleasantly pleased to find that the animals were healthy and alert, the grounds well maintained, and the nostalgic charm alive and well. As a child, my favorite Catskill Game Farm activity was feeding bottles to the baby animals in the nursery. Though the bottles now cost $1.50 instead of a quarter, visitors can still feed the babies, who are anxious to get to know you as soon as you step away from the counter with a bottle of milk in your hand. Budget a bit extra for both bottles and crackers, as feeding the animals and seeing them up close is what creates special Catskill Game Farm memories. Though you won't be able to offer them a sip or a nibble, the Game Farm is also home to a large array of wild creatures, including several rare and endangered species. In all, there are more than 2,000 animals to see, representing more than 150 species. I'll introduce you to a few of the critters we met and tell you more about the history and allure of the Catskill Game Farm when you join me on my virtual photo tour. Though it won't be quite as much fun as taking your own family to see the animals, you won't have to face a herd of hungry English fallow deer who know you've got crackers under your shirt, either. 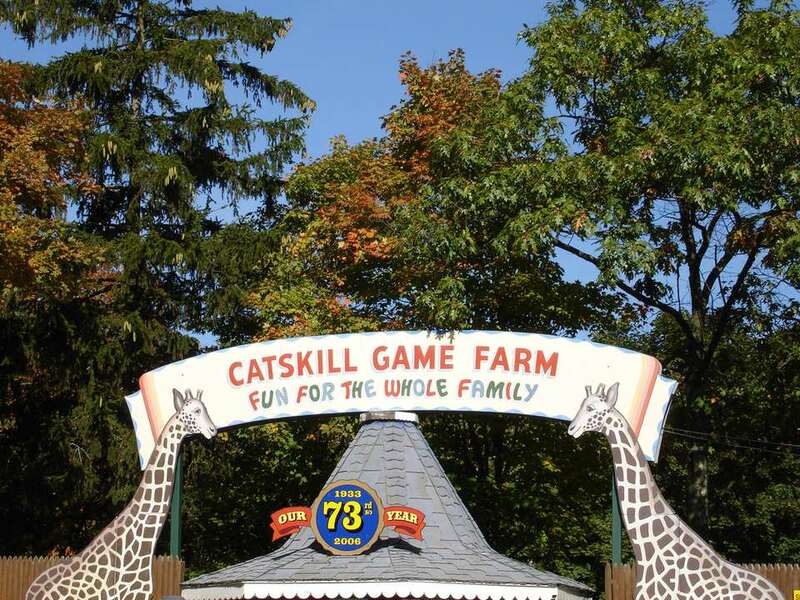 Location: You'll find the Catskill Game Farm on Route 32 in Catskill, NY. The Game Farm can be reached easily from the New York State Thruway, I-87. Directions are available at the attraction's Web site. Hours: The Catskill Game Farm is open daily, late April through early October, from 9 a.m. until 5 p.m. each day with extended hours until 6 p.m. in July and August. From Memorial Day through Labor Day, there is more to see and do, such as a daily schedule of animal shows and an interactive water-play area for kids and adults known as Splash Pad. Admission: As of 2006, admission is $17.95 for adults, $15.95 for seniors, $12.95 for children ages 4 to 11 and free for children 3 and under. A season pass is $35 for adults, $25 for children. There are additional charges for animal food, amusement rides in the children's playground, miniature golf and a train ride. Parking is free. Tip: Wear comfortable shoes, and keep in mind that hungry animals who want the bottle in your hand may muddy whatever you're wearing a bit. For More Information: Call the Catskill Game Farm at (518) 678-9595 or visit the Catskill Game Farm Web site.